Venvstas Carbon V Fountain Pen Review – Pens! Paper! Pencils! Lucio Rossi, the man behind Venvstas, got in touch with me soon after this review was published and we’ve exchanged several emails. 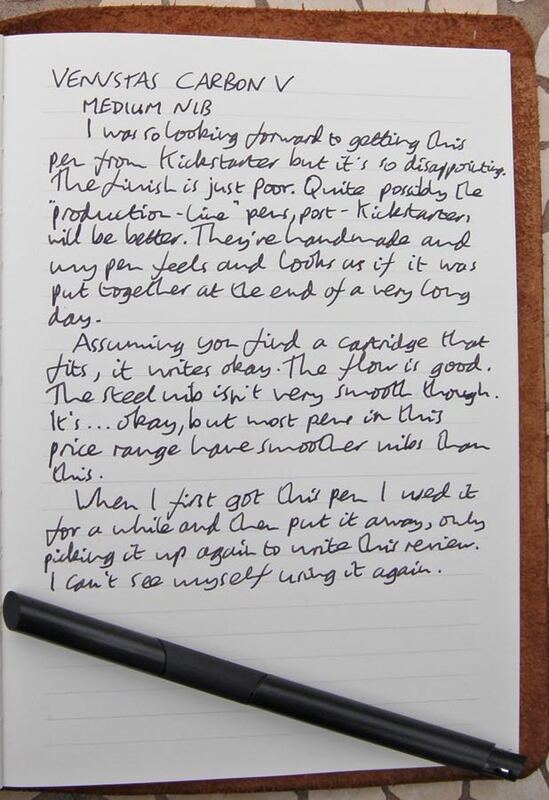 He had undertaken to replace all the original Carbon V pens with an updated version and made the same offer to me. The new version is better. The finish is neater and there’s no scratching of the converter. It’s the pen that should have been sold in the first place and if it had been, I would have been able to write a positive review. I do believe Lucio is sincere in his quest to sell high quality and uniquely designed pens. He made mistakes with the Kickstarter campaign but has learned from them and spent a lot of time, effort and his own money trying to put it right. The Carbon V is now discontinued and Lucio is concentrating on other designs, one of which I hope to review in the future. Truly bad pens, as opposed to good pens that I just don’t like, aren’t always the result of a company cynically exploiting consumers by just not bothering with good design or good manufacturing, though I suspect that’s usually the case. Sometimes it can be the result of good intentions poorly executed. There’s no way of telling which is the case with the Venvstas Carbon V but looking at this one-man operation’s social media output I suspect it’s the latter. That makes this review a little awkward – the Carbon V is a terrible pen – but if I know I pen isn’t worth your money I feel obliged to let you know. However, I’ll do it as kindly as possible. It’s worth noting that Venvstas tweeted that the issues with the converters/cartridges have now been fixed. As always, though, I can only review the pen in front of me. 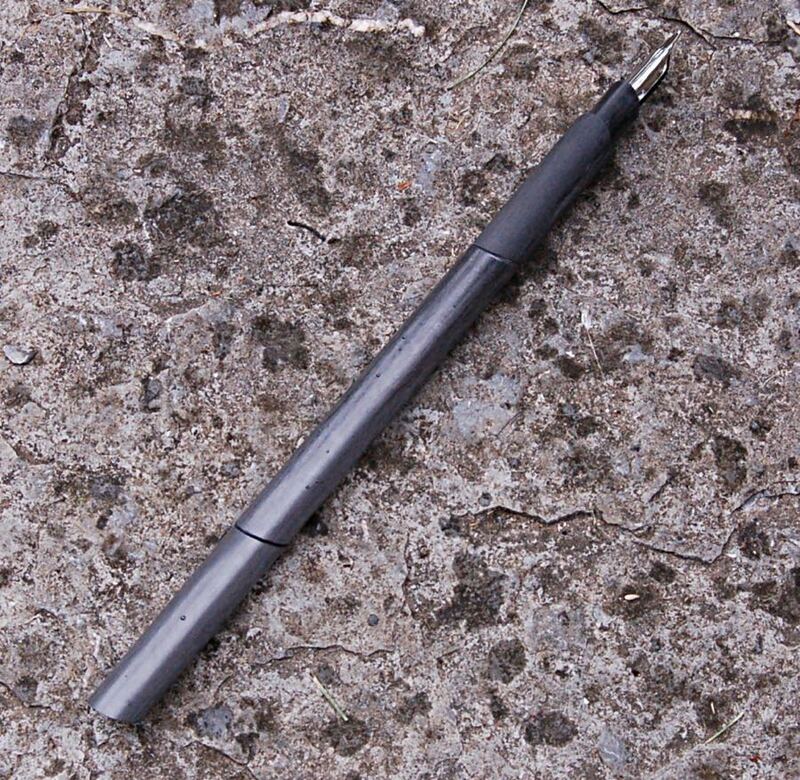 The principle appeal of this pen is its all carbon-fibre construction. I really like carbon fibre as a material, which is why I (and 173 others) backed the Kickstarter campaign back in December. From a distance, the pen looks sleek and, in the hand, it feels light yet strong. Close up, the finish seems a little untidy in places. Much worse, though, is the gap between the cap and the body. These pens are handmade and I wonder if Lucio Rossi, the man behind Venvstas, just had too much to do to fulfil his Kickstarter commitments. The pen shouldn’t have gone out like this. The cap is held in place at either end of the barrel with a small metal spring. These work but are ugly. They’re also not quite straight, which reinforces the impression that not enough care was put into its manufacture. The Carbon V uses standard international cartridges or converters. At least, it kind of does. The barrel is held to the section by means of metal strips. There is no space to spare inside that barrel. I first tried to use a Montblanc cartridge. Although more or less standard size, Montblanc cartridges are a little fatter than standard and there was no way they were going to fit. I then tried a Schmidt converter. You don’t really get any more standard than that. It slid in (unlike the Montblanc cartridge) but I couldn’t push it in far enough to connect with the feed. When I took it out, the metal strips scraped all along the converter itself. Not a big deal for something that’s not generally designed to be looked at but incredibly annoying to have something damaged like that. Finally, I tried a Diamine cartridge and got it working. In the hand, the Carbon V is a comfortable length and being so light it’s fine posted or not. The nib is quite smooth and has good flow. It’s functional but lacks character. 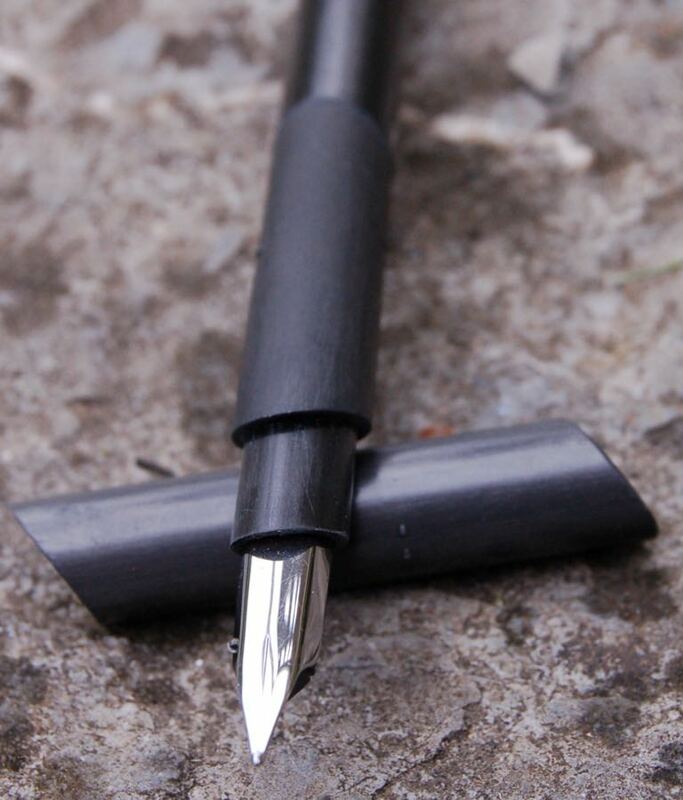 The Venvstas Carbon V is a handmade pen that feels as if it was made in a rush. It wouldn’t surprise me if other people have pens that look great. However, I can only talk about the pen I have, and I’ve seen other people commenting about the same issues. Even more of a problem is the filling mechanism which is poorly thought through. It’s okay if Montblanc cartridges don’t fit because they’re not quite standard but it is definitely not okay if a standard sized converter not only doesn’t fit but is damaged. What’s more, I’ve seen that some people (including the mighty Mr Brown) haven’t managed to find anything that will fit. As such, it’s a pen that doesn’t look finished and doesn’t work as it should. I’m sorry to hear that your experiences have reflected mine (for me, the pen was only on loan). I agree with everything you say here, including the observation that Mr Rossi’s company appears to border on exploiting consumers. Following my review, he went on a tirade on the Pen Economy website (under the pseudonym Max). I hope reviews like these can warn people about the current state of affairs at Venustas, at least until the quality control issues are permanently solved. These pens have some nice design features, so I do hope the issues wil be sorted out in the future. Pity. 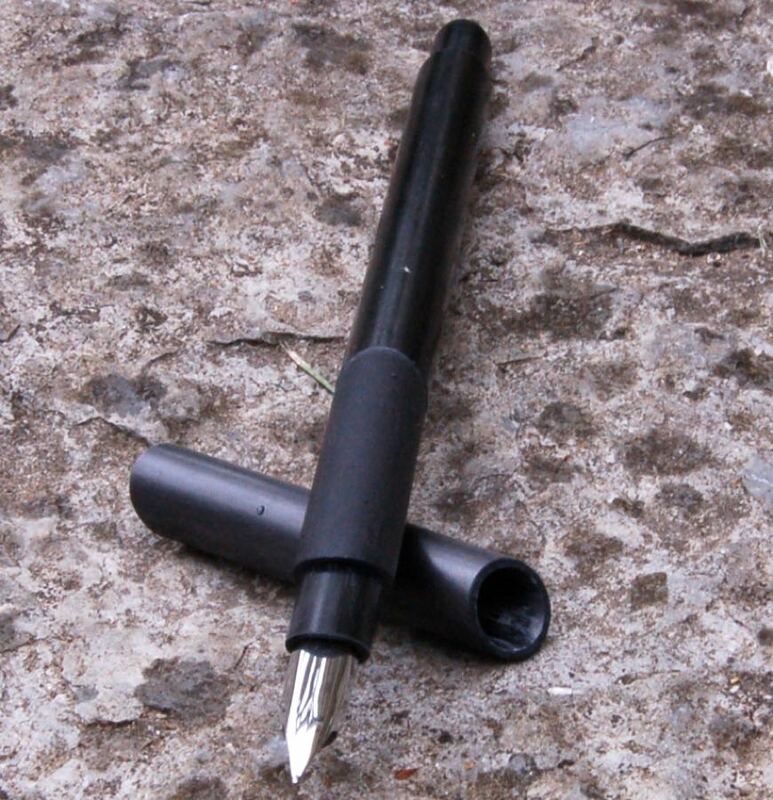 The pen looks so “to the point.” For me: Rough prototype made with poorly set up machines. Looks to be kinda skinny, pencil-esque. Several clever ideas there but, as it is, it’s “an objet d’art” to kind eyes. 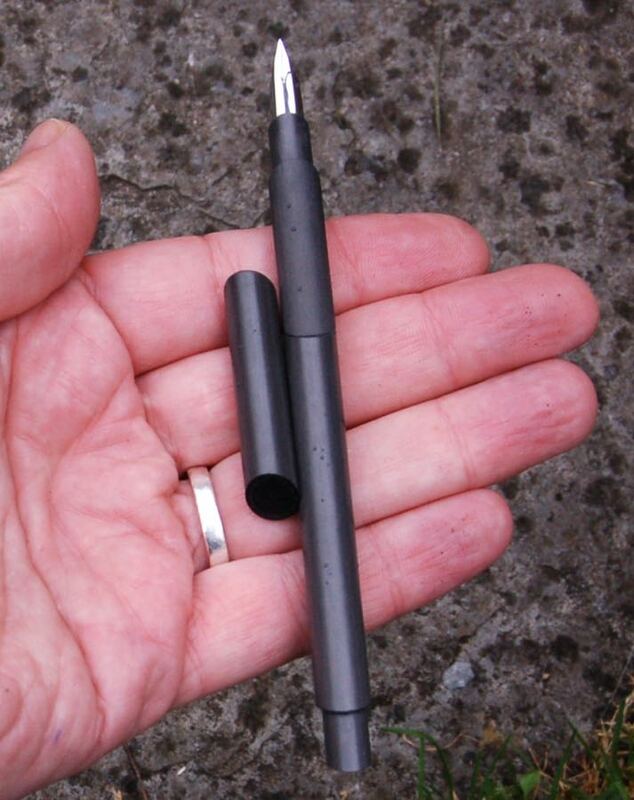 I would like to see a carbon pen with a bit more girth. With something in the way of fit. The design concept is interesting, especially the grip, and nib presentation. This review is definitely up to your standards!